OK, so you might be looking at the following infographic and my title and thinking there’s a typo. 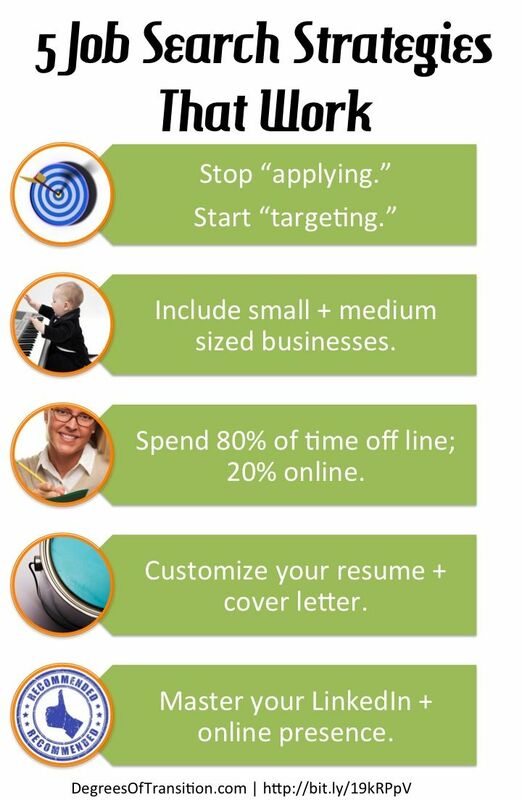 The infographic from DegreesofTransition.com discusses 5 job search strategies that work (although most professionals use them…sparingly…to say the least). You’ll notice I left job boards off of here. It’s not that job boards don’t work; it’s that they don’t work very well. Therefore, although they are certainly fine to use as an “easy” job search method, all they really end up doing is putting you in a pile with the masses, hoping you’ve beat the automated applicant tracking systems at their own game. Believe me if I thought applying to job posting after job posting were the way to go, I would not have spent the last couple years revamping our entire job search solutions offerings at ITtechExec and NoddlePlace to include these 6 methods. Admittedly, these methods aren’t as “easy,” but they are proven to be much more effective once you know the best way to maximize on them. In my book, that actually makes them a very “easy” choice and a great return on your resume, LI profile, and other branding investments. Let’s face it. Why continue to hang out and wait with the masses if you don’t have to?